AVL Scarefest - Is that a vampire in your closet? Apparently, we need to clean the office more often. Yesterday, we were busily shuffling paperwork from one end of the office to another, when Minion #6 heard a strange noise from the south corner. Sort of a slurping, humming, moany sort of a sound. Peeking around the stack of paperwork (they get to eight feet tall, around here, and have swallowed more than one unlucky Minion), she saw a strange figure hunched over on the floor. Dressed completely in black, with pale skin, and glazed eyes was what appeared to be a young emo woman. And then Minion #6 noticed that the young woman had her teeth in a red ink cartridge she was holding to her mouth, and ran screaming for cover. Which was not polite, but we should all be able to agree that drinking ink is neither normal nor healthy. Anyway, after we gathered our courage to investigate the thing (read: Minion #13 poked it with a stick while the rest of us watched from across the room), it started talking and said it's name was Hilda and it was looking for a job. It just got distracted on the way to talk to us. We're not sure we believe it, in fact some of us think it was actually spontaneously generated from the Bad Printer Discard Heap...but it's kind of scary so we're letting it stay. It says it is "totally amazing" at decorating, and therefore Hilda will be put in charge of decorating for AVL Scarefest this year. If you would like to volunteer to help set up or contribute decorations this year, let us know. And we'll tell Hilda. Or at least we'll email her from across the room (she currently licking red Jello powder off her desk, we'd hate to interrupt. 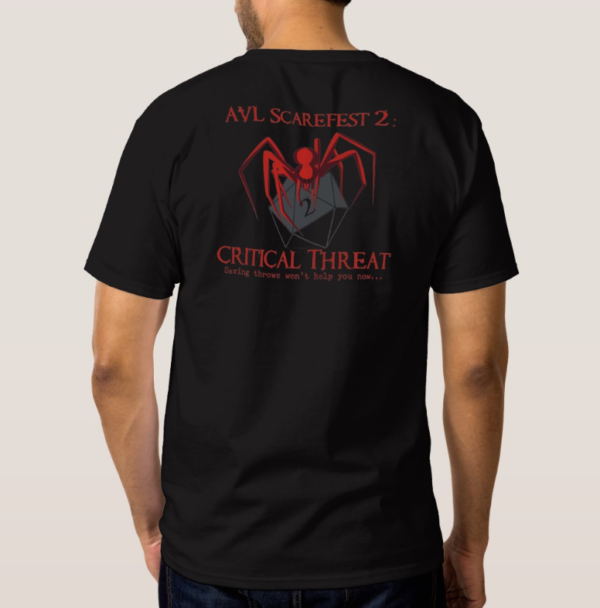 They're comfy, they're styley, and they demonstrate your Geek Cred to everyone you meet: the AVL Scarefest con t-shirt. Also, we've been in negotiations with the Sleepaway Camp Murderer, and he's agreed not to kill anyone wearing one of our t-shirts. So that's a nice perk. Pre-order today and you can pick up when you arrive! Refer a friend...win a prize (maybe). We have an amazing roster of games and an impressive group of GMs. We have prizes to give away (more about that later...stay tuned to Facebook). We just need players to fill all the tables. So tell your home group, tell your friends, tell random strangers on the street! If they list you as their referee when they buy a ticket, we'll enter your dame in a drawing for a magic set of dice. 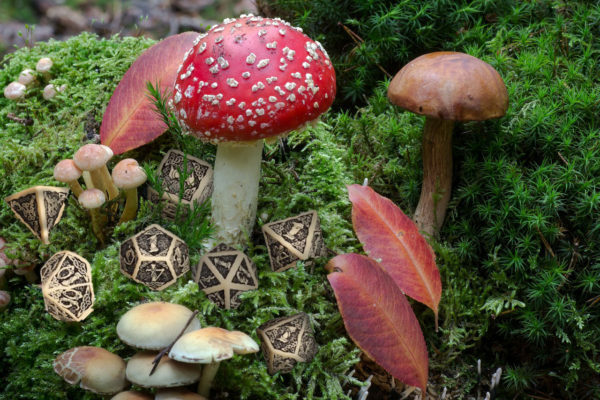 Those dice up there, in fact. A set of dice forged by a family of blind dwarves for an Appalachian witch who performed an ancient ritual over them that took 13 days and involved at least three chickens (no chickens were hurt in this process), a biscuit recipe her great great granny brought over from Scotland, and a jar of her own tears mixed with crabapple butter. Then she laid them in a faerie circle and we had to get the hedgehogs to carry them out one by one in their little mouths (because we're afraid of faeries). Every person who lists you as a referee when they buy their ticket gets you an additional entry in the drawing for these priceless dice. We still have rooms at the lodge...but not for long! If you're been procrastinating, the time is upon you! Go get your room right now! Meal tickets are available this year! Last year a lot of folks had trouble getting out and getting food in the breaks. This year you can get your food right on campus so you never have to miss a minute of gaming goodness. Believe us, you really do want to do this. Keep an eye out for next week's Facebook posts (and probably a newsletter summary) featuring some of our amazing prizes we're giving away this year. We've given the Yeti a typewriter and told it to start showing off the nifty stuff we've got to give away. So far there have been loud crashing noises from its office and the "z" key came flying out under the door...so it should be interesting to see what it produces.